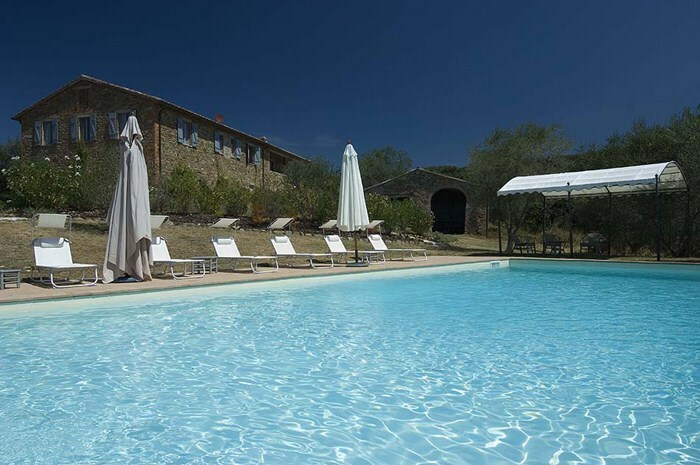 In the direct vicinity of the nature park at mystical Lake Trasimeno and the medieval town of Magione – the home of the Knights of Malta in the 13th century – is the beautiful and luxurious farmstead of Casale Cortese. 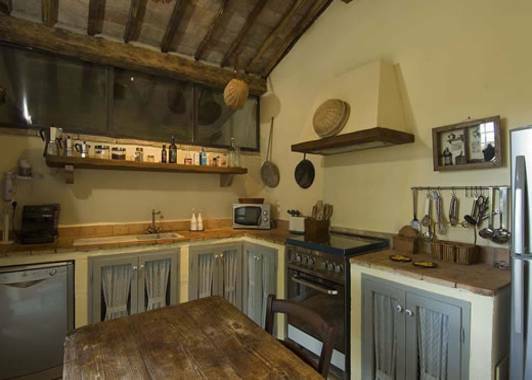 It owes its tasteful yet inviting atmosphere to a cautious renovation, retaining the authentic, clean style of rustic, the original architecture but adding modern comforts and practical functionality. The house has a subtle elegance, characterised by wonderful ceiling beams, terracotta and wooden floors, stylish furniture in wood and wrought iron and the use of tasteful materials. All the individually designed bedrooms have their own bath areas. Air conditioning ensures pleasant temperatures, whatever the weather. 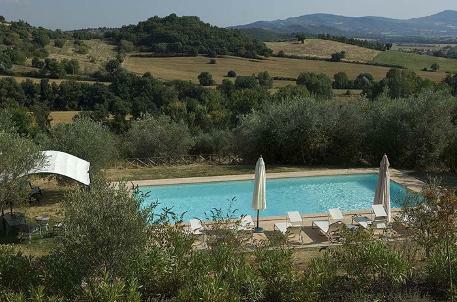 Anyone seeking relaxation can spend happy hours in the quiet courtyard, on the pergola terrazzo, or topping up their energy in the generously sized swimming pool surrounded by olive trees and flourishing vegetation. 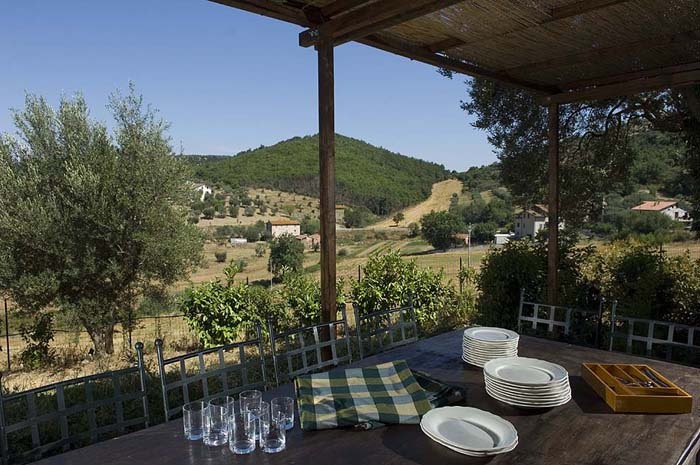 Anyone seeking variety can enjoy many different excursions to the nearby medieval towns and villages. Anyone still not sure which of the two they are looking for, can simply revel in the view of the gorgeous hilly landscapes all around. 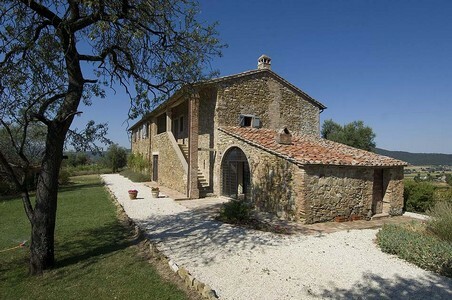 Square metres: 350, G.F.: entrance, dining room with fireplace, living room, Kitchen, 1 bathroom. 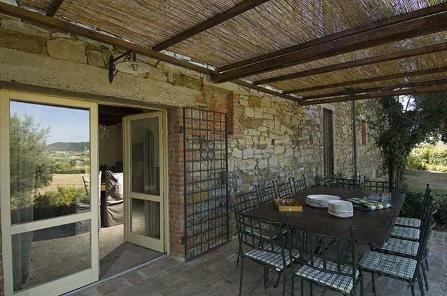 Outside: patio, garden, terrace-solarium, swimming pool, guest apartment with external kitchen, table tennis, laundry. Mezzanine: 1 suite with double sofa bed, 1 bathroom with shower, 1 double bed in the loft. 1st F.: living room - study (access also from an external staircase), 1 double bedroom with en-suite shower, 1 double bedroom (four-poster bed) with en-suite shower, 1 double bedroom with sofa and en-suite bath, 1 double bedroom (four-poster bed) with en-suite bath, 1 double bedroom with en-suite shower.